Just another group of Sandhill Cranes … or maybe not. The surreal scene began with me standing in the ditch at the side of a grid road a few kilometres from home. Beyond the barbed wire fence, a large stubble field stretched out before me that was occupied by snacking Sandhill Cranes and geese. After photographing the birds feeding in the stubble, waves of sandhills starting flying into the field. I would hear them in the distance and line up my camera as they got within range. Suddenly I saw a huge white bird flying in among the next wave as though it was just part of the gang. This wasn’t exactly a seamless camouflage. In fact, I don’t know of any bird that could stick out more glaringly. A Sandhill Crane is an impressive size but quickly gets dwarfed by the Whooping Crane’s impressive proportions. The stark black and white feathers only amplified the contrast. It’s not exactly Where’s Waldo, but if you look very carefully, you might find a whopper of a crane in the photo. Despite the comical-like differences, the Whooping Crane flew, walked, ate and wandered around as though it was just a part of the sandhill gang. I had to admire the chutzpah. Apparently it was just believing something to make it seem like it was true. Maybe I’ll have to try that sometime. Krahnpix note: I am still pinching myself that I had the opportunity to photograph one of the rarest birds in North America- there are less than 500 Whooping Cranes in the wild. This may have been a younger bird that got separated from the rest that migrate over a good portion of North America. The route just happens to cross over Saskatchewan. Whooping Cranes have an impressive wingspan of 7-8 feet. Thanks for sharing these amazing photos. I love your blog and should comment more often. I’ve never seen cranes in the wild. How beautiful they are! I’m glad you enjoy the blog. 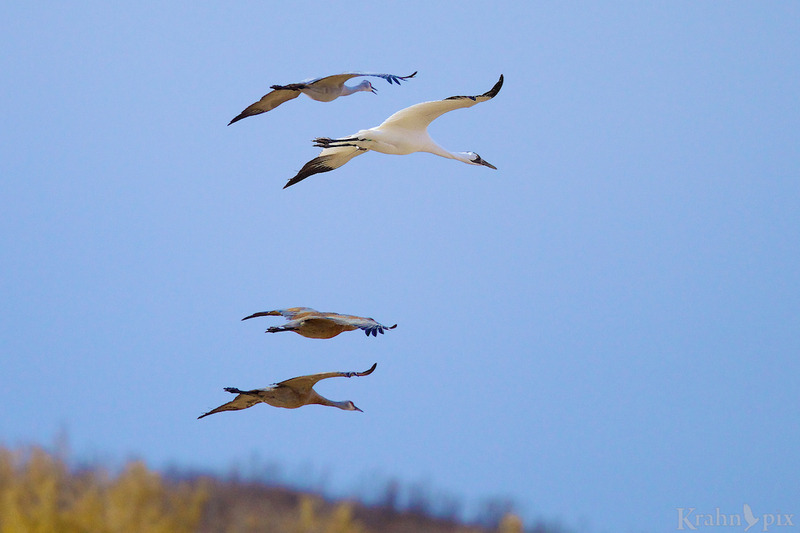 The Whooping Cranes and Sandhill Cranes really are amazingly beautiful creatures and so much fun to shoot. I appreciate the comment. I chuckled at my response–of course it’s straight anthropomorphism, but… I remembered playing with an older friend who would occasionally join my friends and me (much, much younger) in some sports. He was so cool–skilled and not at all concerned about being seen with young (and much smaller) “athletes”. When he played, we all played better and he showed enough restraint that he never dominated. I had no difficulty imagining the Sandhills accepting the Whooper in such a vein. I also thought of my older friend who was not afraid to give some younger ones a chance to dream of a day when they, too, would be able to “play” at another level! The laugh’s on me. Thanks for letting me share. I imagine that when one posts an image it is impossible to imagine the shores on which the “ripple” might lap. Memories are wonderful and can be triggered by all sorts of things so it’s fun to see where they land. I enjoyed your story from days gone by and I can definitely see how it applies to the crowd I photographed. Taking it one step further, it appeared like they too were all benefitting from the experience. Thanks. It would be fascinating to know the bird’s full story but that is unlikely. It seemed to be getting along just fine with the sandhills anyway. Thanks. It’s interesting to hear from someone who has seen these magnificent birds on the other end of the continent. Have fun with that. What a tremendous experience and a real treat I expect. Congrats on this rare and wonderful sighting. It was a real treat! I don’t really expect it to happen again – of course I never expected the first one. Wow, congratulations!! to the sighting and the great photographs! What a treat, and thanks for sharing this rarity! Thanks. That was one of those rare surprises that is unlikely to be repeated in my lifetime. I typically like planning but this is better. It’s always fun to find the one amongst the many, isn’t it? Considering that birds tend to flock together, it is interesting to find the one exception and wonder why. All nice ones, Lyle. For obvious reasons here in the dead of winter, so to speak, the second nice warm image is especially appealing. I have a few images from fall that I have been saving for that very reason – it drags out the feeling and helps me nurse through the wildlife drought that winter typically brings. You’re so right about finding that one in a crowd and wondering why. The interesting part is that I’ll never know. Definitely easier to find than Waldo in the pictures. Glad that you were able to capture pictures of this whopper. I used to be a big fan of Waldo and still like the concept so I couldn’t resist. It was a special experience. Oh Lyle, that is utterly fantastic. Having watched that video about the folks raising the whooping cranes, it makes sense to me that this guy appears to have imprinted on the sandhills. Now I’m wondering if they can cross breed? I find all this stuff about rescuing these precious birds so fascinating. I hadn’t noticed that reporting form so I used it. The efforts they have made to try to save the Whooping Crane are quite remarkable and fascinating. I am so pleased that they are making steady progress. Given that back story, it made the sighting that much more exciting! Do let us know if you hear anything back from that report. Hard to imagine how you could add to the incredible excitement of just seeing one, but I understand. There is a special thrill when a person can combine the sighting and photos on a completely unexpected discovery. If I’d have known that it would make you feel almost famous, I would have posted this a lot sooner:) Thanks for all the wows. Another word for sitting on them would be savouring. I’m much better at that than waiting. Well, that explains it. I’d better learn how to savour then. Quickly. Lyle, how amazing is such a fantastic moment! You should submit this to the Audobon Society or Cornell Laboratories. Thank you for sharing these delightful photos and stories behind them. It was one of those special times when everything aligns. I would have been pleased with just the sandhills. It’s my pleasure to share. Thanks for the comments. Congratulations, Lyle, on your newest (and probably rarest) capture. It certainly deserves a boisterous celebration. If you celebrate, be sure to get some photos–we all want to see what a Whooping Krahn looks like. Full points for your humour on that comment! I’d definitely want to see that too! Awesome. I’ve read that researchers actually put whooping cranes eggs in sandhill nests to see if they will raise them – wonder if that could have happened here? Amazing. That is interesting. It would be pretty neat if it worked. Glad you liked the post. It was a great opportunity. From the reading I’ve done, the comeback has been challenging but they seem to be making steady progress. There are also birds in captivity that are being reintroduced to the wild. Thankfully it’s not the crisis it was. Wow, what an amazing thing to happen! Did you notice the tags on its leg? And I thought most of them wintered in South Texas? I’ve never seen one, but I’ve often thought of making the trip down to Padre to see them. I was pretty excited about it. I did notice the tags on one leg and there’s a radio attached to the other. Here’s a map of the migration route https://www.savingcranes.org/images/stories/site_images/species-field-guide/wc_map2012_800.jpg which I found quite interesting. Way cool! Thanks for the map. Interesting. I like the (maybe inadvertent?) use of “Whopping Crane” in the photo caption – they are whopping [big] cranes! I wonder if you could find out who this guy is. You can see the bands easily in the photo, so anyone working with the Whooping Cranes would know who he is. Unfortunately it was unintentional but I liked your idea so I modified it slightly so it looks less like a typo. Thanks for that. You obviously know much more about banding. I checked around to see if there was information on banding but couldn’t really come up with anything definitive. I did find the migration route https://www.savingcranes.org/images/stories/site_images/species-field-guide/wc_map2012_800.jpg which I found quite impressive. The other leg of the Whooping Crane had a radio so someone is tracking its journey. Thanks so much. I’m still pumped about finding it. Thanks so much. It definitely made a good day better. Lovely pictures of delicate & gracious creatures. Delicate and gracious are great words to describe them. It was a lot of fun to watch. It sure would be interesting to find out what happened to him. There was a radio attached to one leg so someone knows. I had read about the program you described but never saw the video – quite it enjoyed it. Thanks. Humans are strange – we push species to the brink of extinction then do whatever it takes to bring them back. Great post. Thanks for sharing. I recently looked up the difference between whopping and sandhill cranes and couldn’t really see it but wow does the diff show up in your photos! Interesting! Thanks. Have seen them all but the snow goose. Awesome. You’re done much better than I despite huge flocks of snow geese that come through here every fall. Cheated a bit with the whooping cranes. Saw them at Homosassa Springs Wildlife State Park. That was when I looked them up as I’d seen sandhill cranes doing their dance under my brother’s bird feeder that morning! Congrats with a fabulous top picture, Lyle!!! I noticed that whiteish color compared to the others and thought for a moment it was a mother with her yearlings, but then there was the size . . . So they mix company? A bit unusual perhaps? But it made for an excellent photo!!! Thanks so much. I don’t really know if they typically mix company but it’s definitely unusual to have one all on its own. And you’re right, it definitely made for a good photo.